This comforter definitely brightens up my room. The comforter is lightweight yet cozy. This is a great addition to my room. And I think its awesome that sheets come with this set!! Complete the look. Looking for a bedroom ensemble that has everything. Look no further. This comforter set, sheet set and decorative pillows all match and are all included in this super set. Enjoy luxury embroidery and pintuck details and trims in a color blocking theme that is sure to decorate your entire master suite or guest bedroom in one purchase. We like to call it the bedroom in a bag. Really like this set!! Am centering a whole remodel of my room around these colors! Loved that it came with the accent pillows. The sheets are a tad thin but still soft and comfy...they are just extra anyway! Wishing it came with a dust ruffle instead because finding the exact gray was tough...but I made it work! The colors are beautifully matched with my daughters grey bed suite. The material is soft and not heavy. The only complaint is that the blanket isn’t long enough for a Queen bed. Fits more for a full sized bed. 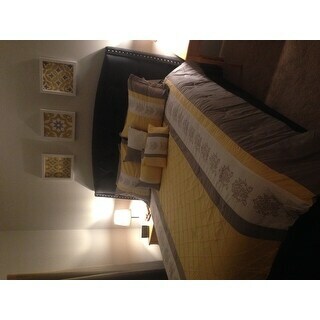 I love my new bed set. It really brightens up my room. The quality is great. I love the softness of the sheet set that is included in the set. Beautiful set. This set is fluffy and not flat, it really compliments my bedroom decor and makes it look more expensive than paid for. I would definitely recommend this product to family and friends. Very good quality. I had one small problem with delivery but customer service was vgreat with getting it resolved quickly. I purchased this as a birthday present for my 80 year old mom. I wanted her to have something pretty and trendy. I wanted her to have something that wasn't what my grandmother had. She absolutely loves this bedding ensemble and I have to admit that I do too. The design is modern but still a little traditional for her. The colors are vibrant and made very well into the design of the comforter. Overall- receiving this made her day and she just loves her room now. Its beautiful and good material, love that the colors match the colors of my walls in our master bedroom. This makes for a nice happy bedroom look. I ordered this set for my daughters bedroom and was happy with it when it arrived. The fabric is very soft. My only complaint would be that the comforter is a little thin and not as warm as I had hoped. We ended up putting a thick blanket underneath it. Overall we were pleased though. what a beauty on top of my king size bed. colors are so warm and yet very elegant. light and also warm comforter. love the whole set and i got compliment from all of friends. Gorgeous bed set. Daughter was very happy with colors. Washed and dried nicely. ABSOLUTELY love it!! Great quality for great price!! I just recently changed my color's in my bathroom to grey and yellow and thought why not do my Bedroom in the same colors!! Love it feels so bright airy and comfy! If you like bright cheery rooms you will love this comforter set. The bright yellow and light gray go tegether so well and it just brightens up the room, makes you want to stay in bed all day. "Do you also have matching curtains?" We don't have matching curtains for this. "What is the threadcount for the sheets?" This item is made of microfiber fabric, thus the thread count is not applicable. However, this product is 90 GSM. It will go perfect with my room perfect colors I am suppose to have a refund of $44.44 on Pay Pay can i use it on this order 245159762. So my total would be $40.00 dollars. Thank you . "Is this a Twin Xl? Thank you, Jennifer "